Only 137 hospitals in the U.S. earned national recognition in at least one of the 16 adult specialties examined in the most recent U.S. News & World Report rankings of American hospitals. 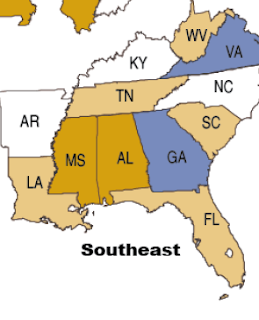 Fourteen of the hospitals earning such a distinction are teaching hospitals from the Southeast. Based on those rankings, here are the Top 5 Teaching Hospitals in the Southeast. The 819 bed, Duke University Hospital in Durham, North Carolina, holds the highest position among teaching hospitals in the Southeast as derived from the U.S. News rankings. Duke University Hospital earned national rankings in 12 of 16 adult specialties, including top 10 national rankings in four of those specialties (Urology, Pulmonology, Ophthalmology and Cardiology & Heart Surgery). In three other specialties (Diabetes & Endocrinology, Nephrology, and Rheumatology) it ranked in the top 20 nationally. Emory University Hospital in Atlanta also earned national rankings in 12 of 16 adult specialties, although it earned no top 10 rankings in any specialty. That said, this 579 teaching hospital earned top 20 rankings in five specialties (Cardiology & Heart Surgery, Diabetes & Endocrinology, Geriatrics, Neurology & Neurosurgery, and Ophthalmology). In three other adult specialties (Cancer, Gynecology and Urology), Emory University Hospital earned top 30 national rankings. Florida Hospital Orlando, with more than 2,200 beds, earns a spot among the Top 5 Teaching Hospitals in the Southeast on the strength of its national rankings in 9 of 16 adult specialties. It's strongest specialties are in Gynecology, where it ranks 13th nationally, and Diabetes & Endocrinology, where it ranks 16th. In two other specialties, Urology and Geriatrics, it earned top 30 rankings nationally per the U.S. News survey. Based in Nashville, the 966 bed Vanderbilt University Medical Center earned national rankings in 8 of 16 adult specialties. This includes two top 10 national rankings, in Urology and Nephrology, and two more top 20 rankings nationally, in Pulmonology and Ear, Nose & Throat. It is a close contest for the last spot on the list of the The 5 Best Teaching Hospitals in the Southeast. The 853 bed, Winston-Salem, North Carolina based, Wake Forest Baptist Medical Center, has national rankings in 7 adult specialties, including 17th best nationally in Cancer and 18th best in Nephrology. The 946 bed, Gainesville, Florida based, UF Health Shands Hospital also has national rankings in 7 adult specialties, but only one top 20 national ranking (13th in Nephrology) and fewer top 30 and top 40 rankings than does Wake Forest Baptist. So while Wake Forest Baptist earned marginally better recognition in its adult specialties per the U.S News survey, in our estimation UF Health Shands merits honorable mention as one of the top all around teaching hospitals in the Southeast. To find other teaching hospitals in the Southeast and elsewhere, visit our U.S. Teaching Hospitals resource page.